It’s been quite some time since we’ve heard anything about Google’s Fuchsia OS project. The search giant is keeping the lid on the whole endeavor. Still, the odd public official mention here and there and the activity on the Fuchsia repository do signify that the project is alive and work on it is ongoing behind the scenes. In a new development, a path was spotted on said repository, adding support for the Kirin 970 chipset and detailing test for booting the Zircon kernel on the Honor Play, based on said chipset. 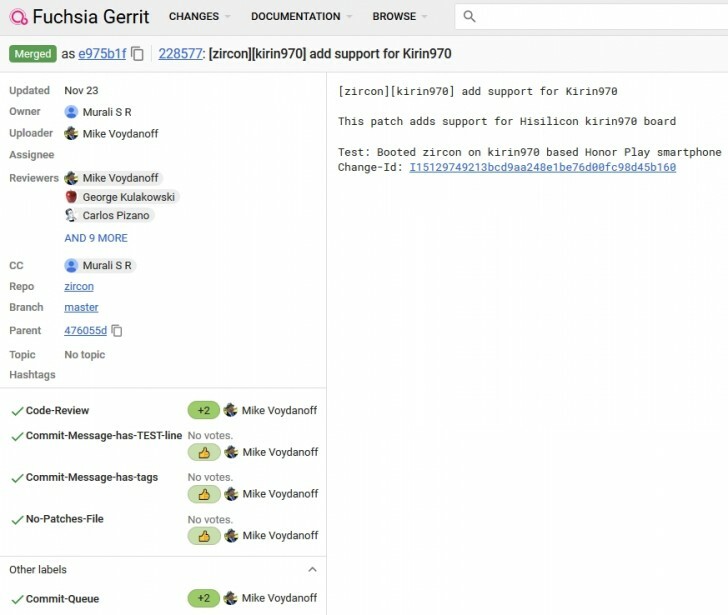 Looking at the patch and its meta data a bit closer shows that the owner (as in the project management meaning of the therm) is one Murali S R with a huawei.com email. This is a clear indication of some sort of cooperation between Google and Huawei on this matter, as opposed to Google simply testing things internally on its own. We are, however, skeptical as to whether this should be considered as any indication that Fuchsia is moving closer to actual consumer products and releases. If you are not in the know about Fuchsia OS, you can take comfort in the fact that nobody outside the development team seems to really know much about it at this stage either. Does wireless charging excuse Apple not using USB-C? Will AMP really speed up your website?